Datames formidabilis Simon 1879: 136–138, figs. 17–19, 25–26. Datames affinis Kraepelin 1899 (misidentification in part, see Eremobates affinis (Kraepelin 1899a): 242–243, figs. 20a–b. Datames cfr. formidabilis Simon 1879: Kraepelin 1899b: 378. Eremobates formidabilis (Simon 1879): Banks 1900: 427. Eremoperna formidabilis (Simon 1879): Roewer 1934: 561, figs. 322b, 323c, 324d. Eremorhax formidabilis (Simon 1879): Muma 1970: 4–5, figs. 1–2. Eremopus formidabilis (Simon 1879): Muma 1989: 5. Eremocosta formidabilis (Simon 1879): Harvey 2002: 451. Male type from Guanajuata, México, No. 1805 (Roewer No. 9130), deposited in Muséum National d’Histoire Naturelle, Paris, France. Recognized Eremopus Roewer 1934 as a junior homonym of the copepod genus Eremopus Brady 1910, resurrected Eremocosta Roewer 1934, transferred Datames formidabilis Simon 1879 to Eremocosta. Datames formidabilis Simon, 1879a: 136–138, figs 17–19, 25–26; Simon, 1879c: 78; Putnam, 1883: 266–267; Bertkau, 1892b: 110; Banks, 1898: 289; Weidner, 1959: 109. Datames affinis Kraepelin, 1899a: 242–243, figs 20a-b (misidentification in part, see Eremobates affinis (Kraepelin)). Datames cfr. formidabilis Simon: Kraepelin, 1899b: 378. Eremobates formidabilis (Simon): Banks, 1900: 427; Kraepelin, 1901: 127, fig. 95; Pocock, 1902c: 63, plate 12 fig. 7; Kraepelin, 1908c: 216; Comstock, 1913: 37; Nesbet, 1921: 15; Pratt, 1927: 408, fig. 644; Roewer, 1932: fig. 116a; Pratt, 1935: 477, fig. 644. Eremoperna formidabilis (Simon): Roewer, 1934: 561, figs 322b, 323c, 324d. Eremorhax formidabilis (Simon): Muma, 1970a: 4–5, figs 1–2; Muma, 1976: 14; Muma, 1987: 19; Vázquez Rojas, 1995: 30; Vázquez Rojas, 1996: 76. Eremopus formidabilis (Simon): Muma, 1989: 5. Eremocosta formidabilis (Simon): Harvey, 2002: 451. Type locality: Guanajuato, Guanajuato, Mexico. Datames cfr. formidabilis (Simon): Banks 1899: 378. Eremobates formidabilis (Simon): Banks 1900:427. Eremoperna formidabilis (Simon): Roewer 1934: 561. Eremorhax formidabilis (Simon): Muma 1970: 4. Eremopus formidabilis (Simon): Muma 1989: 5. Eremocosta formidabilis (Simon): Harvey 2002: 451. Type material.— Datames formidabilis: Male holotype from Guanajuato, Mexico (MNHN). Datames affinis: Male holotype and female allotype from Arizona, USA; No. 7297, Roewer No. 9129 (MNHN). Recorded specimens.—Three males and a questionable record from Arkansas (probably Arizona). Distribution.—USA: Unknown. Mexico: Guanajuato. Biome: Sonoran Desert." Type material. Male type from Guanajuata, México, No. 1805 (Roewer No. 9130), deposited in Muséum National d’Histoire Naturelle, Paris, France. The female and young with the type are not conspecific (Muma 1970). Muma’s examination of types found a female paratype labeled “Arkansas” in Zoologisches Staatsinstitut und Zoologisches Museum in Hamburg, Germany he thought to be conspecific. The locality is apparently incorrect. If it refers to a locality in the United States then it is unlikely to be the female of E. formidabilis. The female chelicera is illustrated as fig. 2, p. 13 in Muma (1970) but no description is provided (see Muma 1970, p. 16). It is not a typical Eremocosta female dentition. 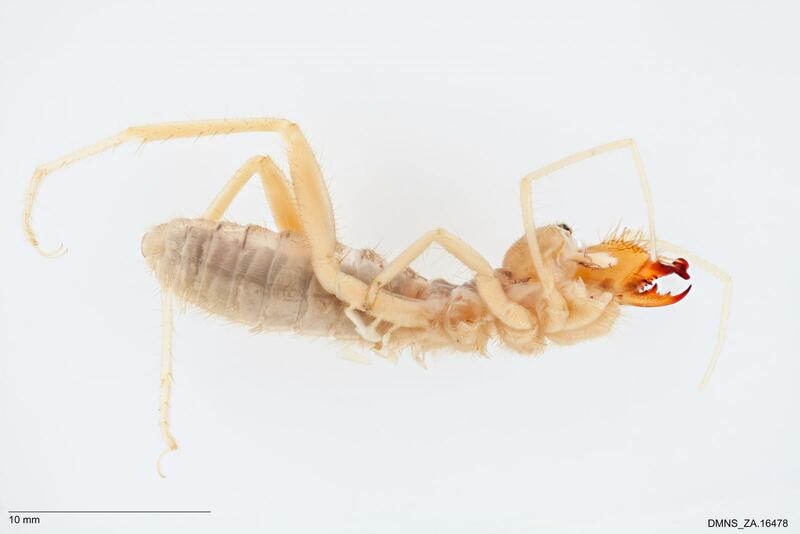 We were not able to examine the type of E. formidabilis but were able to examine males of this species from localities near the type locality: male from San Luis Potosi, México (Texas Tech University) and a male from Durango, México and San Luis Potosi, México (IBUNAM). Specimens examined. Males (2). MÉXICO: Durango, Ciudad de Durango, DAO, N 24.051000°, W 104.610200°, 1890 m elev., 15 February 2005, no coll. (IBUNAM CNAN no number); MÉXICO: San Luis Potosí, Salinas, N 22.627610°, W 101.716498°, 2077 m elev., 20 June 1970, coll. G. Cárlos (IBUNAM +CNANSol00006). Diagnosis. E. formidabilis is easily distinguished from all other Eremocosta by the location of the VDC which lies proximally instead of distally on the ventral edge of the male fixed finger (Fig. 1C). It is also smaller than others and the dark tips of the pedipalps are also distinctive. Measurements (n = 2). TL 22.0, 30.0; CL 6.6, 10.0; CH 2.8, 4.7; FNL 0.3, 0.5; FNH 0.3, 0.5; FFH 0.8, 1.3; PL 17.0, 23.0; PT 1.4, 2.7; PMT 5.7, 11.5; LI 11.0, 13.0; LIV 16.5, 16.5; PPL 4.0, 4.3; A/CP 4.2; FNL/FNH 1.0, 1.0; FFH/FNH 2.8, 2.8; FFH/CH 0.3, 0.3. Description. Coloration. Overall coloration pale, palpal tarsus, metatarsus, and inner surface of tibia dark brown; LIII and LIV with similar but lighter coloration on tibia-femur joint area; propeltidium coloration pale (Fig. 5C). Chelicera. 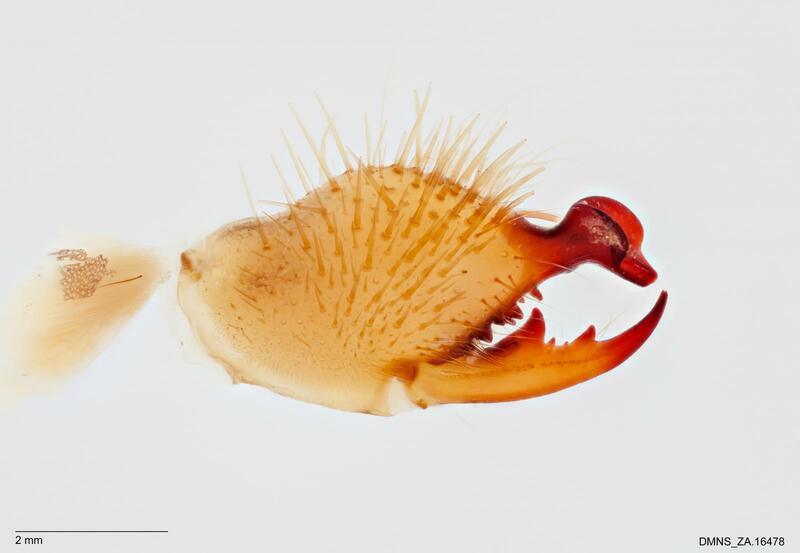 Chelicera as in Muma (1970, p. 13, fig. 1–2). VDC proximally located (Fig. 1C). Neither Roewer (1934) nor Muma (1970) mentioned or illustrated this unique position of the VDC. Fixed finger with no median dentition. Movable finger: large MP-three MSM attached to MP; distinct MPL (Figs. 2I & J). Fondal notch narrow, longer than wide (Fig. 2I). Two tiny RFA; fondal teeth I, III, II, IV prolaterally and retrolaterally (Fig. 3C). Setation. Dorsal setal complex typical tubular; pvd extend to top of fondal tooth I; mpd a proximal patch. A few, tiny, scattered bacilli on coxa of LI. Pedipalps with scattered, long, thin setae, and shorter, thicker setae. Palpal tibia with a series of strong setae basally on the mesal surface. No visible paired setae. Distribution. This is a Chihuahuan Desert inhabitant whose range includes Guanajuato, San Luis Potosi, and Durango, México. Discussion. Putnam’s (1883), Roewer’s (1934), and Muma’s (1970) descriptions are adequate. Two tiny RFA in fondal notch (Fig. 3C). Roewer (1934) indicates 4 ctenidia but Muma (1970), in examining the type, found no ctenidia. The two males that we examined had no ctenidia. MEXICO: Durango, Guanajuato, San Luis Potosi.